FORT WORTH, Texas – Fernando Alonso is approaching his meticulous preparation for a second Indianapolis 500 start next month as if 2017 never even happened. Considering that Fernando emerged from a near-perfect Month of May two years ago with 27 laps-led and as Rookie of the Year despite an engine failure, that pragmatism typifies the two-time Formula One World Driving Champion. 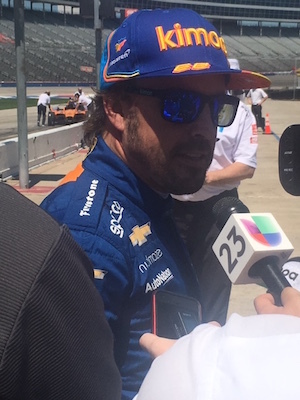 Alonso’s bid for victory in the 103rd edition of the Indianapolis 500 on May 26 _ possibly the final leg of Fernando’s personal Triple Crown quest _ began Tuesday afternoon with a day-long shakedown session around Texas Motor Speedway. 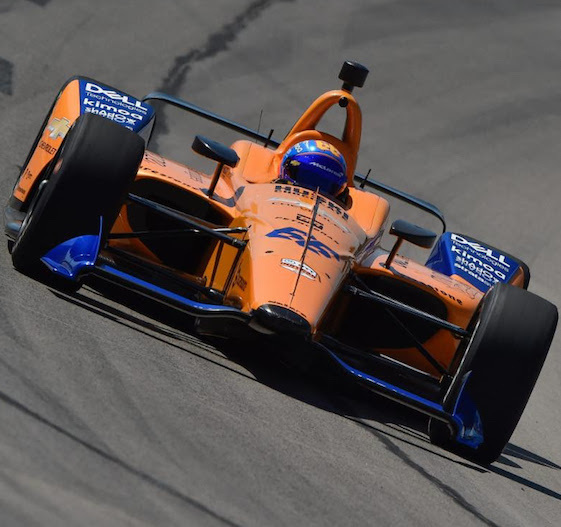 Dealing with ambient temperatures in the low 90s, Alonso and his crew acclimated themselves to TMS’ high-banked/1.5-mile oval with the sister car of the No. 66 McLaren/Chevrolet he plans to qualify and race at Indianapolis Motor Speedway. That said, Alonso added he already feels “a lot more prepared” for everything that comprises “The Greatest Spectacle in Racing” on IMS’ famed 2.5-mile oval. Alonso qualified the No. 29 Honda fielded by Andretti Autosport fifth for his first oval-track race two years ago and was running seventh when an engine failure on Lap 180 of the scheduled 200 ended a storybook Month of May. Tuesday’s test was the first for Alonso on an oval other than IMS. The 37-year-old Spaniard did not compete in an NTT IndyCar Series event in 2018. “Obviously, it’s only the first couple of laps with the car and we’re taking care of everything, slowly building the speed,” Alonso said. “But, yeah, I drove the Indy car at Barber (Motorsports Park’s road-course) last year but it’s good to be back on the oval with a very specific setup and this car that turns left, self-steering a little bit. Again, some weird feeling for me but trying to get used to it. Also, the speedway (TMS) is very special. There’s a lot of banking on the corner, especially in (Turns) 3 and 4 so very different than Indianapolis but, hopefully, a good preparation for us. The papaya orange No. 66 car unveiled by McLaren Racing Monday is en route from the McLaren Technology Centre in Woking, United Kingdom, to the USA ahead of an open test around IMS scheduled for April 24. The 2019 NTT IndyCar Series schedule does not include an oval race prior to the Indy 500. Alonso’s ride with Michael Andretti’s team in 2017 featured Honda power and the manufacturer’s Speedway aero kit package. Sanctioning body INDYCAR switched to a universal aero kit furnished by Dallara for engine suppliers Honda and Chevrolet last year _ another new item for Alonso to address. The F1 World Champion in 2005 and 2006, Alonso will be looking to secure the final leg of motorsports’ Triple Crown with a victory at IMS. The Spaniard won F1’s “Crown Jewel” street race _ the Monaco Grand Prix _ in 2006 and 2007 driving for Renault and McLaren, respectively. Alonso added a victory in the 24 Hours of Le Mans in his debut in the French sports car endurance classic in June 2018 driving a Toyota hybrid along with Kazuki Nakajima of Japan and Sebastien Buemi of Switzerland. With his shared victory at Le Mans, Alonso became one of only 13 drivers to have won two of three legs of the Triple Crown. Two-time F1 World Champion Graham Hill of Great Britain is the only driver to have won at Monaco, Le Mans and Indianapolis. Alonso exited McLaren’s struggling F1 program after the 2018 campaign with career totals of 22 poles, 32 victories and 97 podium finishes. He began 2019 as a member of Wayne Taylor Racing’s winning Cadillac DPi team in the Rolex 24 at Daytona in January, the season-opener for the IMSA WeatherTech SportsCar Championship. Alonso shared the No. 10 Caddy with American Jordan Taylor, Renger van der Zande of The Netherlands and Kamui Kobayashi of Japan. Alonso said the Triple Crown truly has become his raison d’etre. “Yeah, absolutely,” Alonso said with a smile. “That’s the target this year after winning Le Mans last year. The Indy 500 is the one left of the big ones. I was lucky enough to win Daytona 24 also at the beginning of the year so one day if I win the Indy 500 it’s not going to be a Triple Crown anymore. It’s going to be a little bit more. Chief among Alonso’s observers here was three-time Indy 500 champion Johnny Rutherford of Fort Worth in his role as McLaren Racing Team Ambassador. “Lone Star J.R.” competed at IMS in McLaren cars from 1973-79, a run highlighted by victories in Offy-powered entries in 1974 and 1976 sandwiched around a runnerup result in 1975. Rutherford and McLaren also finished last in the 1977 race. Rutherford said Alonso is a perfect fit for the organization founded by the late Bruce McLaren of New Zealand. “He (Alonso) is an exceptional champion, the best title to hang on him because he knows what he’s doing, where he’s going,” Rutherford said. “I’m here to witness and I will be at Indianapolis to just watch and see if there’s anything…that place can throw so many curves at you that I’ve had the experience of 24 races at the Indy 500. I think he’ll do well if getting this late start doesn’t hinder them. Alonso said Rutherford’s initial advice at TMS specifically centered around the track’s banking differences. Turns 1 and 2 are banked at 20 degrees after a recent repave and reconfiguration while Turns 3 and 4 are banked at 24-degrees exiting into the narrow front stretch dogleg. Rutherford said he is intrigued by Alonso’s determination to win the Triple Crown. “He’s made it known that he wants to win it all eventually,” Rutherford said. “Indianapolis, he came here two years ago and looked like he was on his way to win the thing. He was doing a great job and it just shows you the kind of a driver he is _ two-time world champion and good at anything he’s been in to race. TMS President Eddie Gossage also viewed the test from pit road, as “The Great American Speedway” welcomed motorsports royalty to Cowtown. “Man, that’s a big thing to have the two-time world champion here and have him testing for the Indy 500,” Gossage said. “Hopefully that leads in 2020 and beyond to him running the full INDYCAR schedule and that includes Texas.” INDYCAR’s annual DXC Technology 600 weekend of night racing is scheduled for June 6-8 and will include the NASCAR Gander Outdoors Truck Series Rattlesnake 400. Gossage also applauded Alonso’s Triple Crown aspiration. “A Triple Crown is a great idea and I think it would be great for it to happen again,” Gossage said. “There have been some great champions that have run across different genres of racing. In the last 20 years or so, Nigel Mansell comes to mind, obviously Juan Pablo Montoya…so many have done it through the years but to have won all three you have to go back more than 50 years. I think it would be an amazing accomplishment. Gossage acknowledged that Alonso’s first Indy 500 experience was a huge public relations success in that it bridged the fan gap between F1 and INDYCAR.